A comprehensive guide to the basics, written by designers for designers. A comprehensive guide by two people who really know their stuff. This book is invaluable for those starting out and getting to know the ropes across the Adobe suite. Not so great for those familiar with the basics, but still helpful lessons to be found. Hey, it’s OK to be a dummy sometimes; especially when it comes to the complexities and nuances of the increasingly vast Adobe Creative Cloud suite. So as a creative (or indeed anyone whose career or hobbyist interests rely on making things with image and text that look clear and pretty) what better gift than the power of mastering these essential tools? What’s great about this particular well-known brand of reference guides is that it’s written by experts, rather than writers speaking to experts (so in this case, designers). As such, the tips and guidance are spelled out in a way that’s not only comprehensible to those in the design industry, but in a way that is tailored to those looking to work in it. The authors Jennifer and Christopher Smith certainly have pedigree: Jennifer is a UX consultant, designer, educator, and author of 12 or so books on digital imaging and web publishing; while Christopher is president of the American Graphics Institute and author of numerous books on web, interactive, and print publishing technology, including many official Adobe training guides. 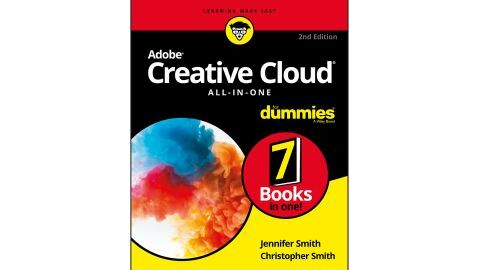 Adobe Creative Cloud All-in-One For Dummies (Second Edition) is divided into seven mini-books across a hefty 800 pages, and covers InDesign CC, Illustrator CC, Photoshop CC, Acrobat Pro, Adobe Bridge, and Adobe XD. While there’s no doubt this book is aimed more at those at the beginning of their creative software journey, it’s undoubtedly helpful for those already proficient in their tools. There's advice on using advanced features, and of course, helping a Photoshop whizz incorporate other tools and work across different programmes to make their lives easier and their work sparkle. What’s potentially off-putting for a book about how to design well is that it certainly isn’t the most beautiful, or indeed well-designed book we’ve ever seen: the icons are ugly; and the typographic decisions leave a lot to be desired. It’s also slightly misleading to bill the title as as 'all-in-one', when it doesn’t actually cover programmes like Lightroom, Premiere Pro and After Effects. But in fairness, it’s probably wise to master the less complex programmes before tackling moving image and animation software. Adobe Creative Cloud All-in-One For Dummies is certainly aimed more at the beginner end of the spectrum, although there’s definitely a few gems in here for the more advanced. However, it might take a bit of slightly frustrating rifling through this hefty tome to get there.